Cool Cooks Catering Company is an established Hertfordshire based family run food catering business located at Hertford Rugby Club that prides itself in offering both quality food and event catering services whilst treating each event or function on an individual basis. COOL COOKS offer a wide range of food catering services; from finger / fork buffets to formal lunches / dinners and barbecues to hog and spit roasts, all freshly prepared in our kitchens for you and your guests pleasure. Let us take the catering worry and strain out of your social event, function or celebration party leaving you to relax and enjoy yourself. 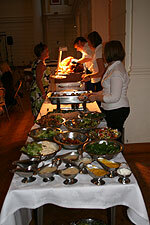 See what our previous customer's testimonials have to say about our catering services. Whether your function or event is outside, in a marquee, village hall, in a fully equipped kitchen and hall or even if you would like to host a Hog Roast or a Barbecue at your own home COOL COOKS can help design your food menu to suit both your surroundings and requirements whilst keeping to a budget. Should you have any questions about our food catering services for your event please feel free to Contact Us to discuss your requirements.